Grumblings about the British Museum, Colombian gold, and looting in public display. Last week I found myself down in London visiting the British Museum’s “Beyond El Dorado” exhibition which is presented in partnership with Colombia’s Museo d’ Oro and funded, in part, by Julius Bär, a Swiss Bank… I went to this exhibit for work: I wanted to see how the looting of these objects was portrayed by the museum. I felt this was a golden opportunity to discuss looting in an less problematic way: the looted objects had all been bought or seized by the Colombian government. While this doesn’t mitigate the damage to Colombia’s archaeological heritage that the initial looting caused, it meant that none of the objects were contested, so to speak. They are not from private collections, nor are they of questionable legal status. I am sorry to say that looting/trafficking/etc was not mentioned in the exhibition. Not even once. The objects were presented as floating in space (and in their cases), unstuck from time. It is as if they appeared, clean and sparking, in a museum. How did they get there? Don’t ask. The absolute closest the exhibit came was a panel that mentioned that the famous Balsa Muisca was “discovered by a group of peasants”. The raft, of course, was not in the exhibit. Indeed, the object was found in a cave in 1969 by farmers from the village of Lázaro Fonte in Pasca. Supposedly hip to all of the issues surrounding the wholesale plunder of Colombia’s archaeological heritage, the local priest, Father Jaime Santamaria Hincapie, somehow managed to calm everyone down in Pasca and notify the authorities about the raft. The raft was found inside an awesome-lookin’ pot in the shape of a sitting dude. A similar gold raft was supposedly pulled from one of the Lagunas de Siecha in 1856. There was apparently a fight over which European museum was going to get their paws on it. It ended up in the hands of the collector Salómon Koppel (the founding Chief Executive of the Banco de Bogotá) who sold it to a museum in Berlin: an act that was legal under Colombian law at the time. The raft was then sent to Germany but it was lost when the ship caught fire in Bremen. 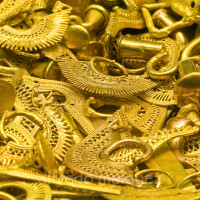 Point is, yes, the gold raft was not archaeologically excavated. The 1969 circumstances are a bit unclear and a bit shady and the BM ALMOST says something about the non-archaeological nature of the object’s recovery by the Museo d’Oro. I really am quite let down by this. I fear the possibility that such a hyped exhibit that shows absolutely zero social conscious about the looting and trafficking of Colombian gold can only encourage the market in this illicit material. I have a lot more to say about this but I am looking for the appropriate venue. Short review paper for a journal? Which journal? 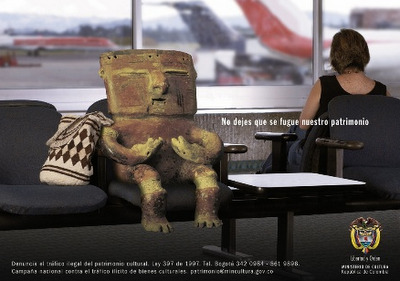 Why not visit ICOM’s Red List of Colombian Cultural Objects at Risk (in English). I was really quite interested in seeing how the British Museum would present the ancient cultures of Colombia. Really, be honest dear readers, how many of you can name a single ancient culture of Colombia (you are not allowed to pick Muisca)? I knew walking into the preview event at the BM that I was likely the only one (or one of very few people) there who was already a fan-girl for some of the objects on display, who had even a glimmer of Colombian archaeology kicking around in their mind. This isn’t a criticism: why should people the UK know anything at all about ancient Colombia? Rather this was a specific hurdle: I wondered how the BM would jump it. No Egypt or Greece baggage. No Aztec sacrifice or Maya mystery. Visitors would be clean slates on which the Colombian past could be written. I hate to say that Beyond El Dorado didn’t seem to move far beyond El Dorado. Indeed I almost felt that an exhibit that was supposed to dispel the El Dorado myth spent more time teaching the public the myth in the first place. They certainly didn’t get everyone straight on the time-line of ancient Colombian culture and how the civilisations related to each other in space and time. I truly doubt that anyone leaving the exhibit would be able to tell you anything about Zenú vs. Muisca vs. Calima–Malagana (and, yes, they called the culture Calima-Malagana without mentioning the looting of Hacienda Malagana in the 90s…which is how that culture got its name). Furthermore, at the start of the exhibit they introduce visitors to five Colombian cultures and placed them on the map. Then, throughout the exhibit, they display artefacts from other Colombian cultures that are not on the map or contextualised. How are viewers supposed to interpret an object that is listed as “Nariño” when Nariño is not an option that has been presented? My that is a big stone stature that you are calling “San Agustín”, BM…but San Agustín isn’t mentioned in the cultures section! All in all, I don’t think visitors are really going to walk away with anything but a spacey and indistinct idea of ancient Colombia. They might pick up the El Dorado myth, they might pick up general, um, crap about “shamans” which will mostly be completely out of cultural context, but as a learning experience, Beyond El Dorado falls well short. And, okay, let’s be honest: the exhibit is about gold gawking, not learning. For your £10 you get to see the strange “Other” sheathed in gold (which, I might add, is not placed on the body in this exhibit so even more decontexualised). That is sort of okay…I guess. It isn’t how the BM is hyping it.